I said goodbye to everyone in our group and moved to another hotel for the next three nights in Yangon. We had seen pretty much all the sights but I went out to see the war memorial just out of town, I revisited the Shwedagon Pagoda at night and finished with half a day of shopping and lunch at the Strand hotel. 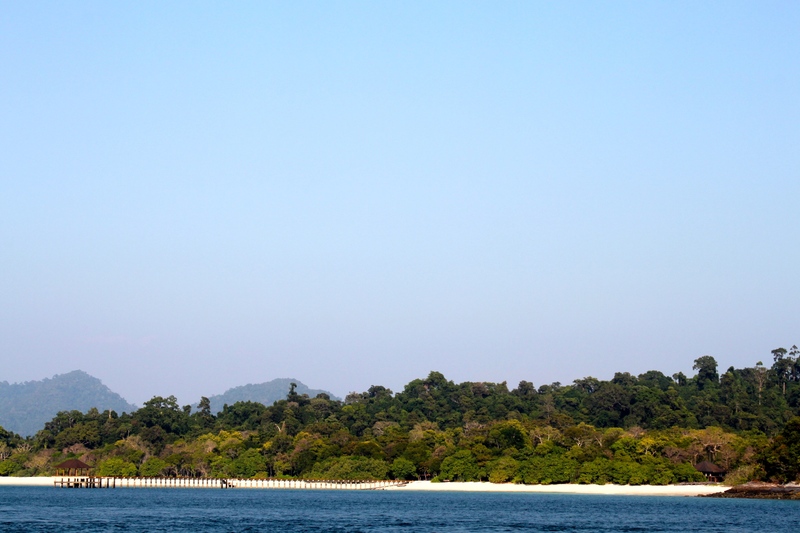 Rather than stay another night in Yangon my itinerary changed at the last minute so I flew to Kawthaung a day early. After leaving super early in case we hit rush hour and then the flight being delayed, I eventually left Yangon at 11.30am in a tiny plane heading south, stopping several times on the way. 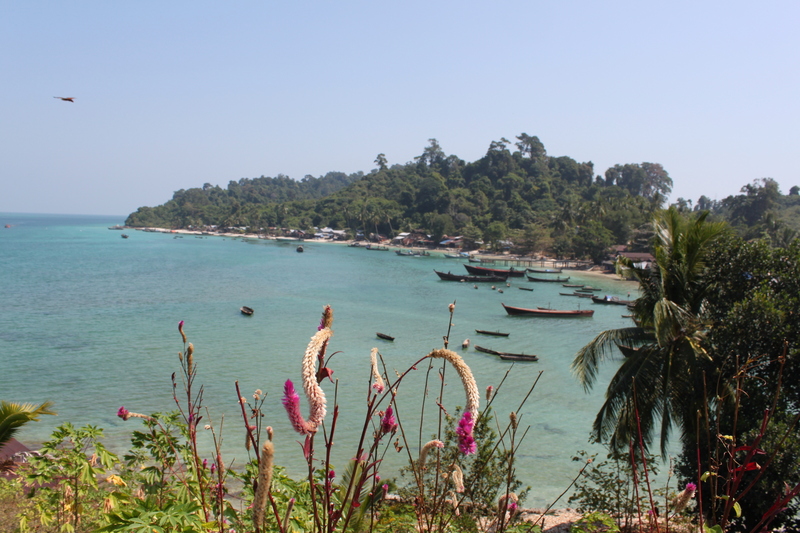 First at Dawei, then Myeik and arrived in Kawthaung at 2.45pm. 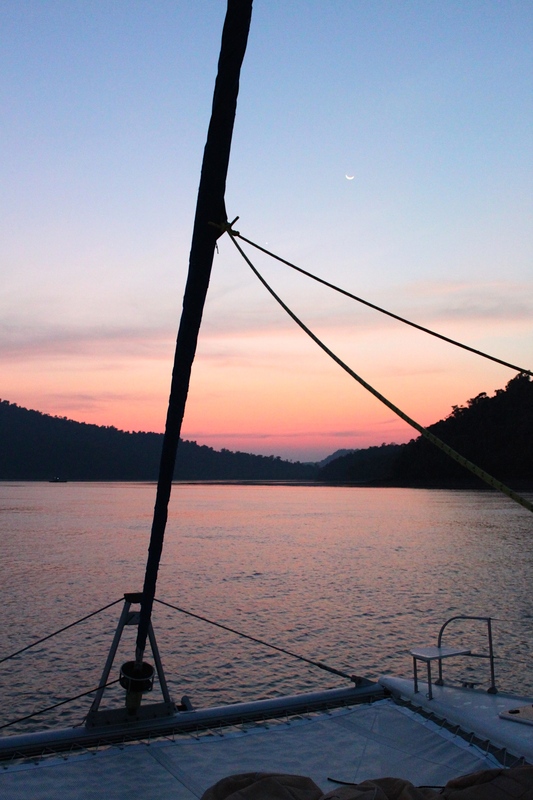 I was one of three westerners arriving and I spent the evening in Kawthaung, a tiny place with nothing in it. 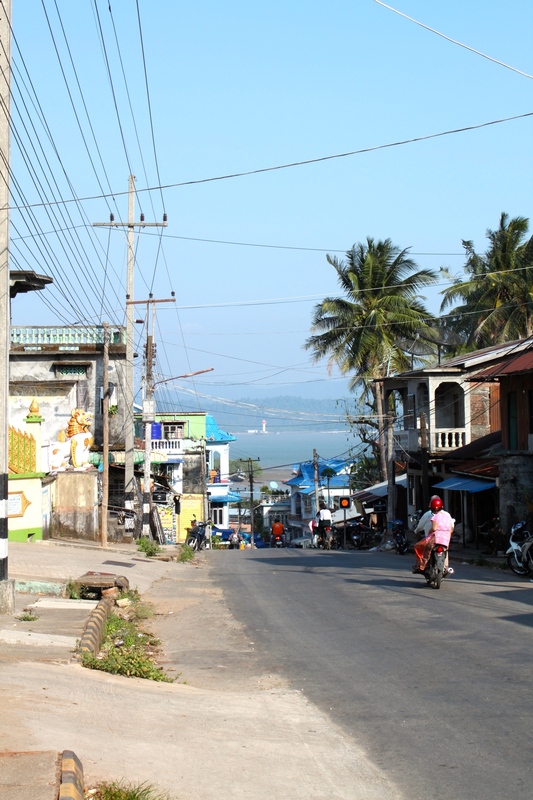 Most people come here on a visa run from Thailand so Kawthaung doesn’t have much of anything. Mr Kyaw Soe, my guide, picked me up at noon the following day and we drove down to the jetty to meet the boat that I would call home for the next week. After my fellow passenger David boarded (he was coming from Phuket), we had to wait for the Burmese immigration officials to come aboard and check our papers. A boat of 6 men arrived in military uniform (which was quite intimidating actually) and looked over everything. It turns out that they will keep our passports with them while we are sailing – slightly disconcerting but they also kept Brian’s, our Irish skipper from Kilkenny, so I wasn’t worried too much. Normal procedure apparently. 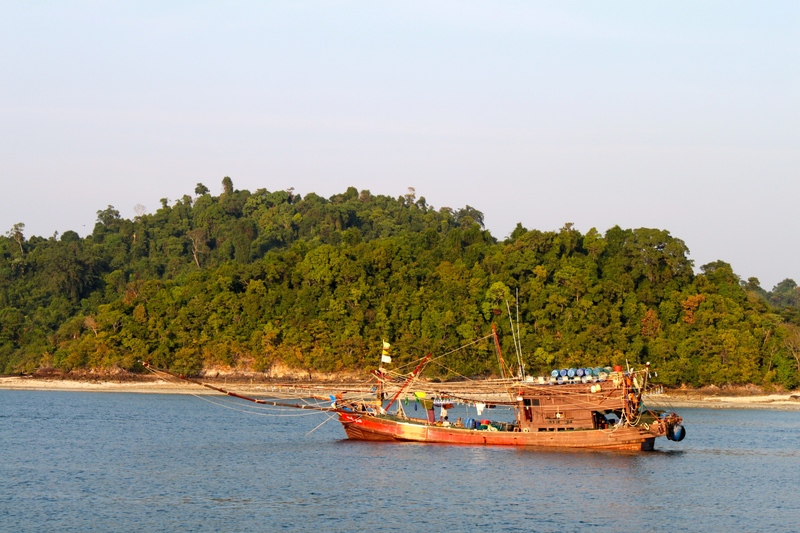 We set sail and cruised past several islands before docking in a channel next to Thai Yae Island. David got in a kayak to explore near the island but I just swam around for about an hour. 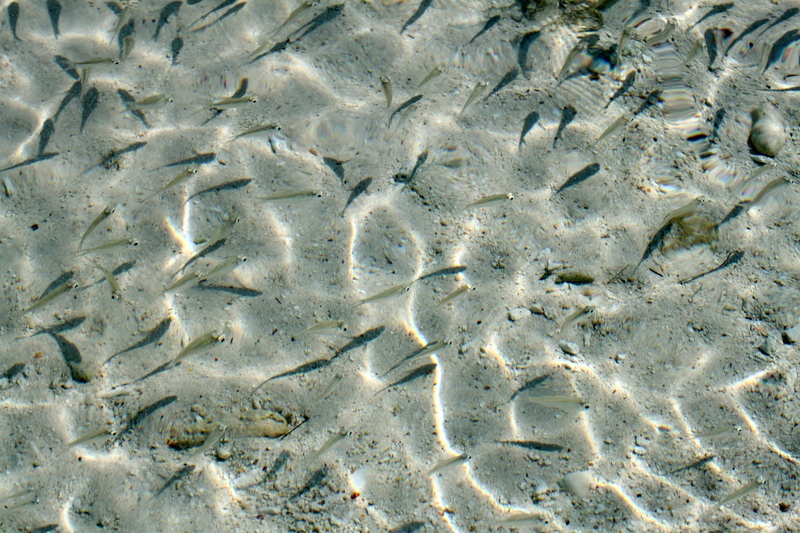 It was very clear water but as it was about 15 metres deep I couldn’t see anything. As I swam around, I counted 8 Brahminy Kites circling round. They were catching fish but flew very close to me – checking out my head probably! to see if I was worth eating. I think my orange t-shirt put them off. You can see that the islands are completely unspoilt. 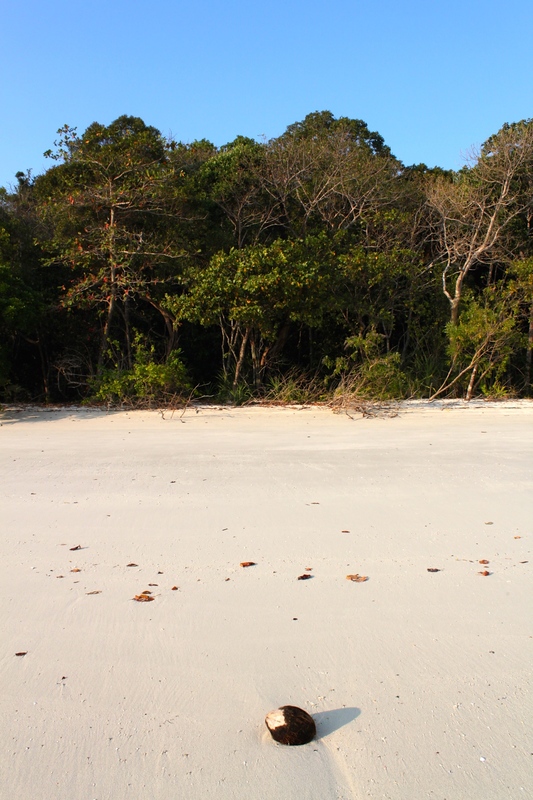 There is a fairly wide sandy beach on one side of the island and then thick forest behind it that has loads of birds. 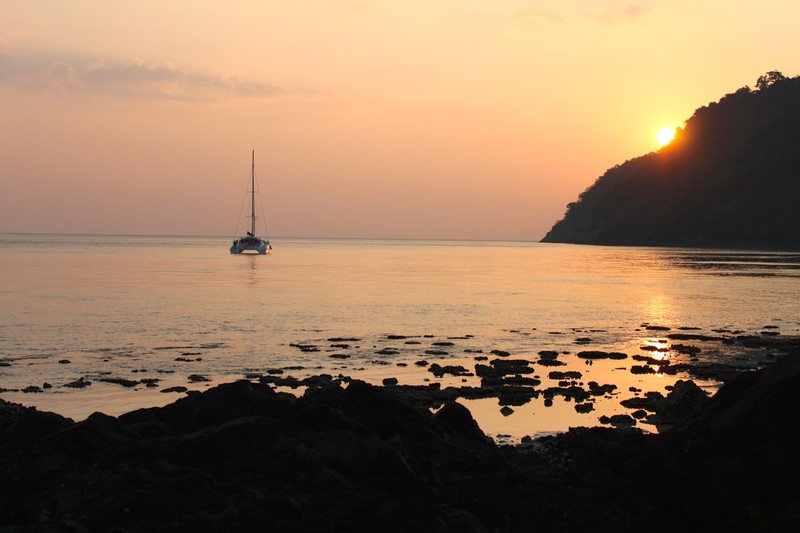 We watched the sun go down and had an amazing dinner, cooked by the resident Thai cook. I can’t imagine 8 passengers on this boat with 4 crew, it would be quite crowded. I’m glad it is just the two of us, with 4 crew we really are getting the VIP treatment! Many fishing boats docked here for the evening before setting off for some night fishing. Before they go to fish, they set off firecrackers from the deck for good luck so it was quite lively in the channel but by 8pm we were alone with no lights around. 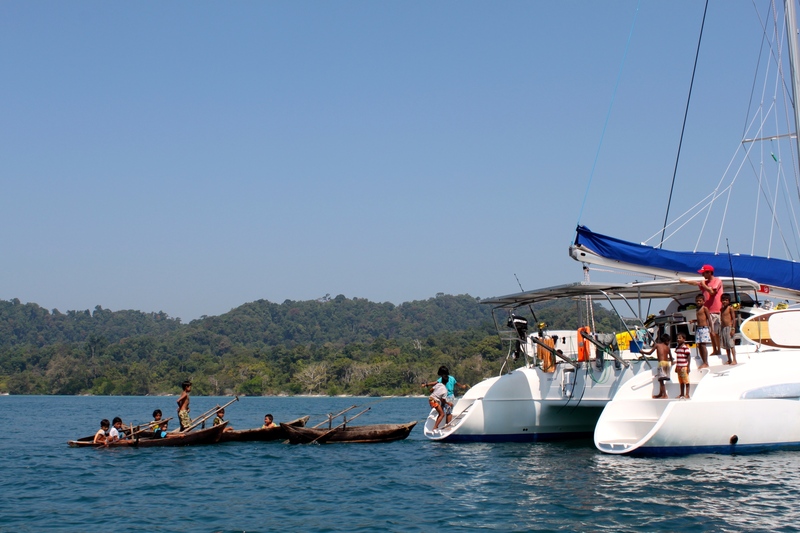 We set sail after breakfast for a predicted 4 hour journey north towards Poni Island. The light winds meant we had to use the engine and arrived just before lunch to a small cove. The light is quite hazy here and just as I think we are sailing into wide-open sea, another cluster of islands spring up. There are no other boats apart from maybe 3 fishing boats that we’ve seen today, it truly feels like we are all alone at the end of the Earth. Most of the day we have no concept of what time it is but then “time here,” as Brian says, “is irrelevant”. We had squid for lunch that was caught that morning by some passing fisherman; we bought if from them in exchange for some beers. We also passed the beginnings of a resort but the guide explained that the General who had rented the islands didn’t have to right permissions so work ground to a halt and all the expensive hardwood he had bought to finish the project was simply left in piles on the island. 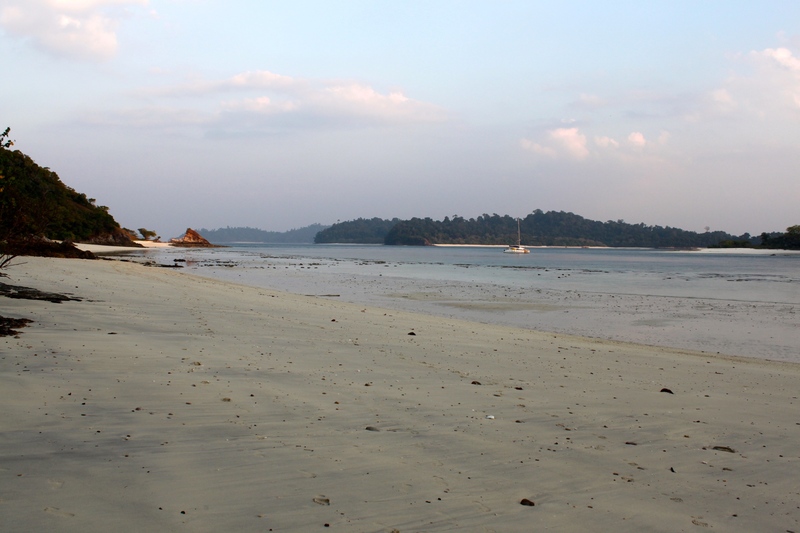 We arrived at Poni Island and I swam to the beach, David took our things in a kayak and we sunbathed there, I swam around the rocks and looked for fish but the sand had been churned up a lot by the current so it was difficult to see. 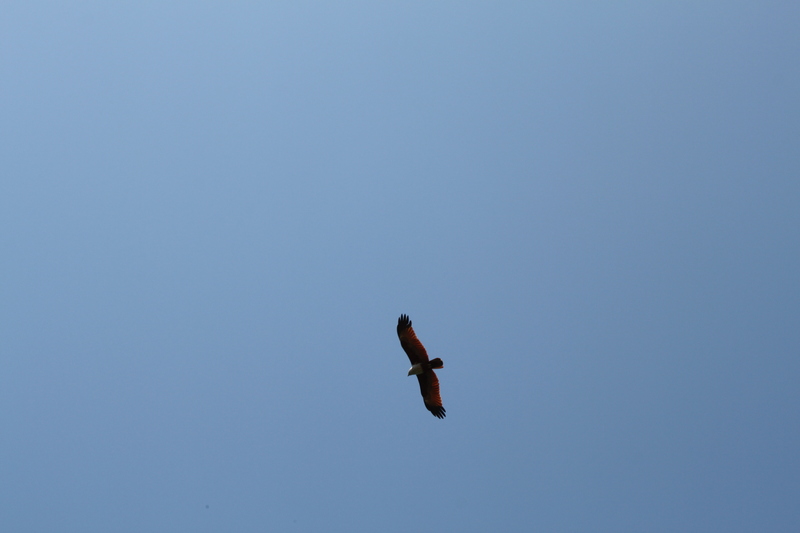 There are three pairs of Brahminy Kites still with us and as I swam back to the boat, they were circling around again. The sea is so deep and dark I am a bit scared to swim on my front and look down into the depths. We got back on the boat and glided round the bay with just the sails to island 115, named after the hill there that is 115m high. The guide and the first mate took us over to the shore in a dinghy and we had to double back a couple of times because the tide was going out and there was a lot of coral to dodge. 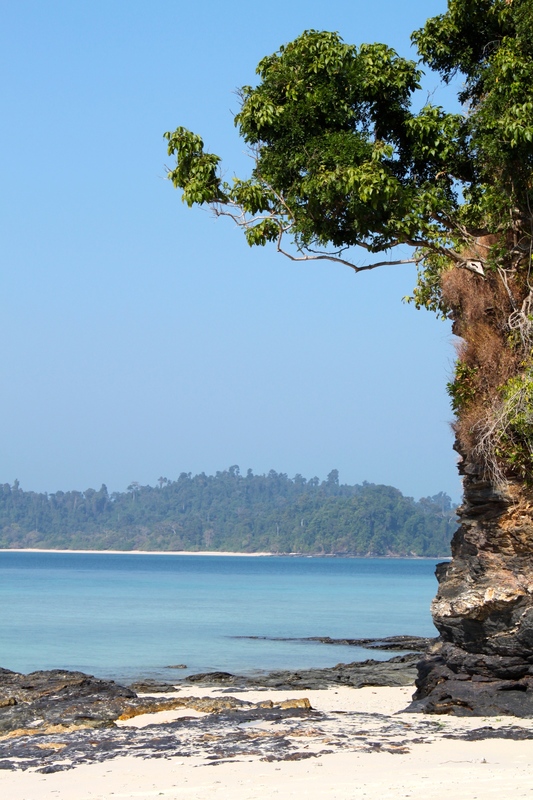 We walked along the wide beach and then cut into the jungle to cross the island. It was only a 15 minute walk but it felt longer because the jungle was so thick and difficult to walk through. 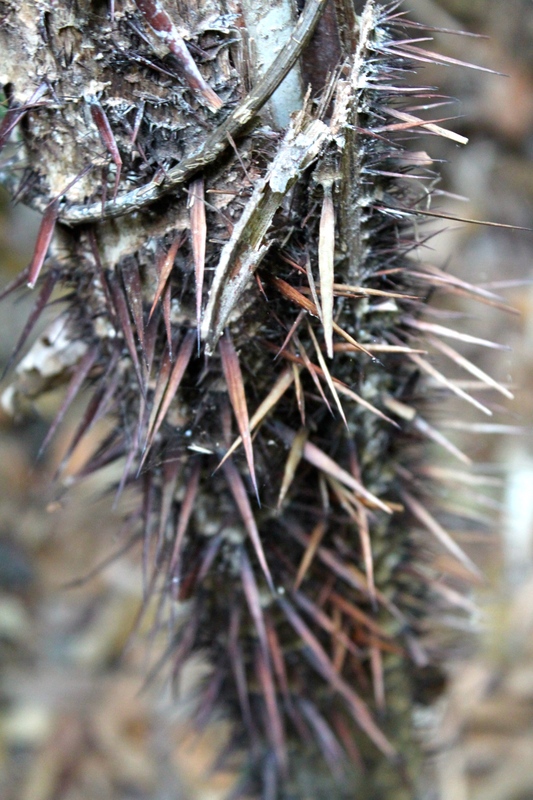 There were strange thorny plants and lots of birds that we could hear and not see. It was difficult to even look for them because you really had to concentrate on not walking into a hostile plant or clump of spiders’ webs. 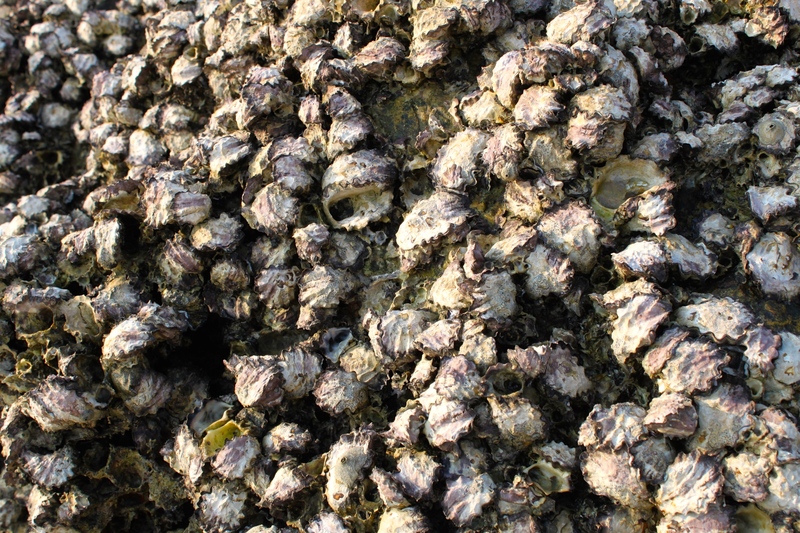 As we emerged on to the opposite beach we encountered three Moken sea gypsies who were foraging for some sort of large mollusc that Brian named as chiton. They completely ignored David and I but spoke to the guide who explained they would sell the chiton as they could reach a good price. 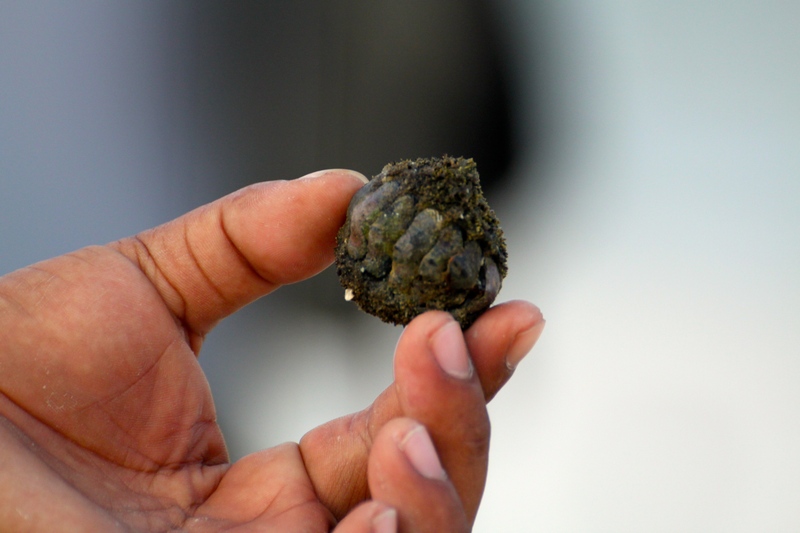 They all kept their cheroot cigars in a plastic bottle and had a little bag to collect their molluscs. 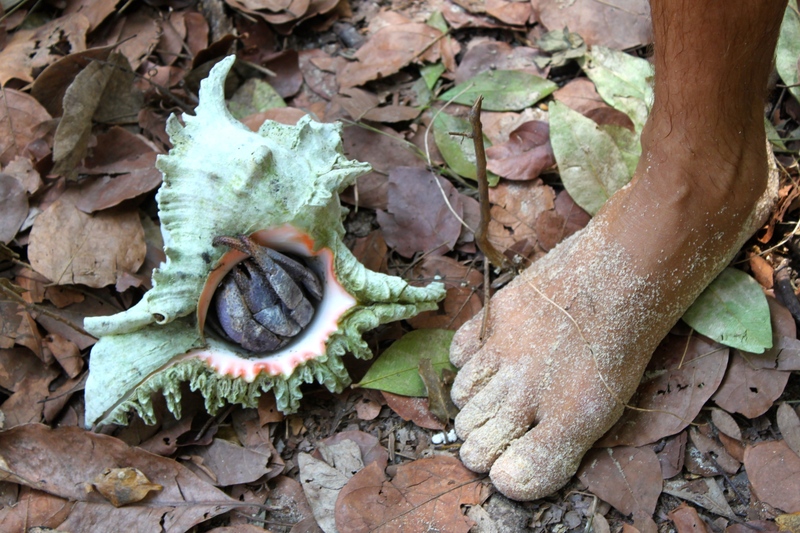 We walked around picking up shells and looking at the different trees along the shore before cutting back into the jungle along the same path. When we came out the other side, it was perhaps 30 minutes until sunset and the light was incredible. The tide had gone out really quickly and there were just huge pools left where the hills were reflected. We stopped there for the night and there were no sounds, just complete calm and bright stars. As we sailed further north again to Bo Cho Island, Brian cast the fishing lines out the back of the boat to see if we could catch anything on the way. There is a Moken village on Bo Cho and as we arrived, lots of kids started rowing out in dug out canoes to meet us. Our guide Zolay and the first mate took us to shore again and we walked round the village, stopping at the school first and then the pagoda on the top of the hill. Everyone was very friendly and it seems as though they are kind of used to foreigners but not too much. 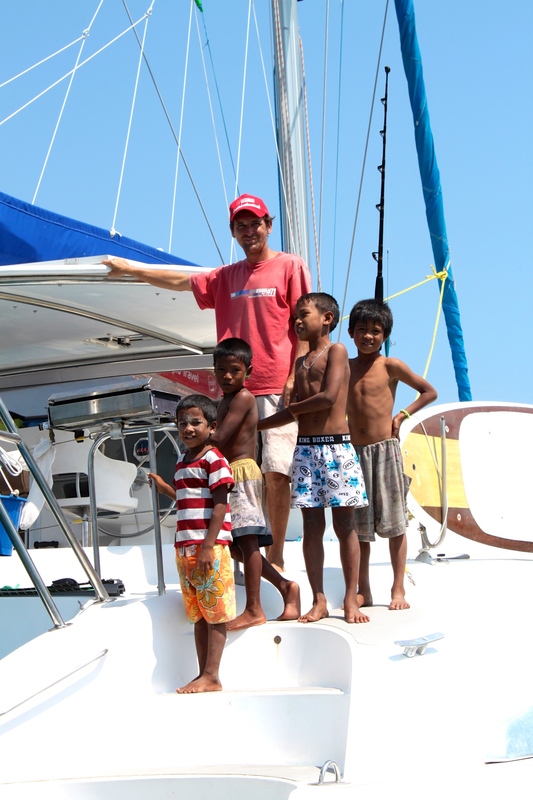 Two little boys wanted to hold my hands throughout the walk and by the time we got back to our boat, there were about 20 kids getting sweets from Brian and clambering all over the catamaran. We got going straight away and had lunch on the move. 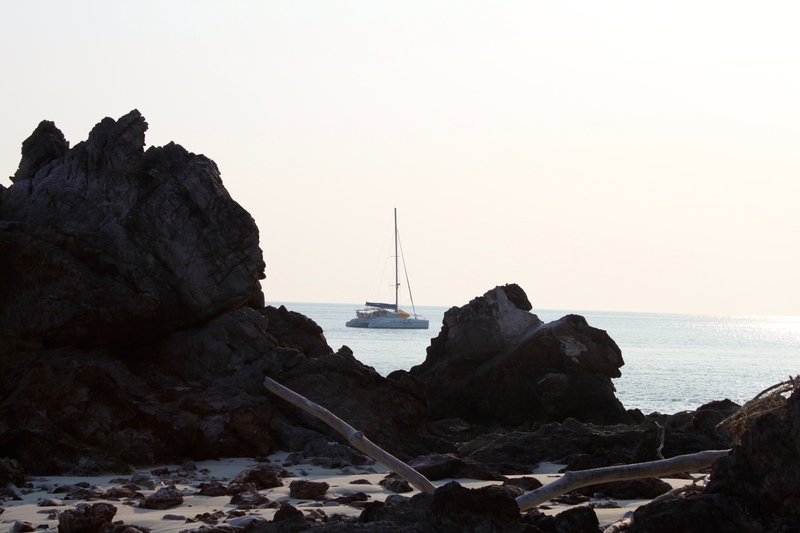 We were heading north again to Lampi Island where we would anchor for the afternoon and the night. The island is huge and we used paddleboards to get to the beach. 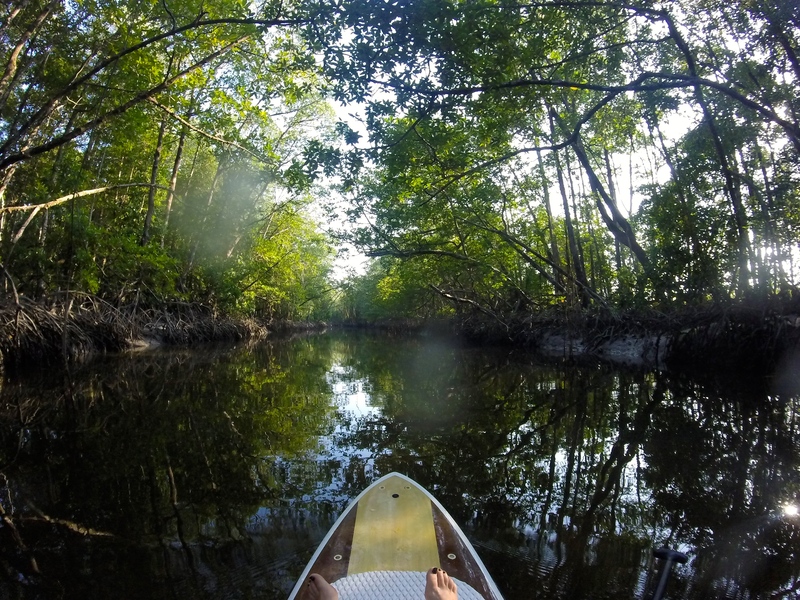 We were aiming for the river that cuts through the island and as we paddled up from the mangroves we saw a very shy Moken family hiding in the bush. I got eaten alive by sand flies but it was beautifully calm, just gliding up the river in complete silence, just the crashing of the surf behind the trees. As the catamaran was anchoring a good 500 metres from the shore, I was relieved to see that the first mate had got the dinghy out to come and collect us. David and Brian paddled back but I got a lift and couldn’t wait to scrub my skin after so many bites. We started in our now familiar schedule in the morning and set sail after breakfast. 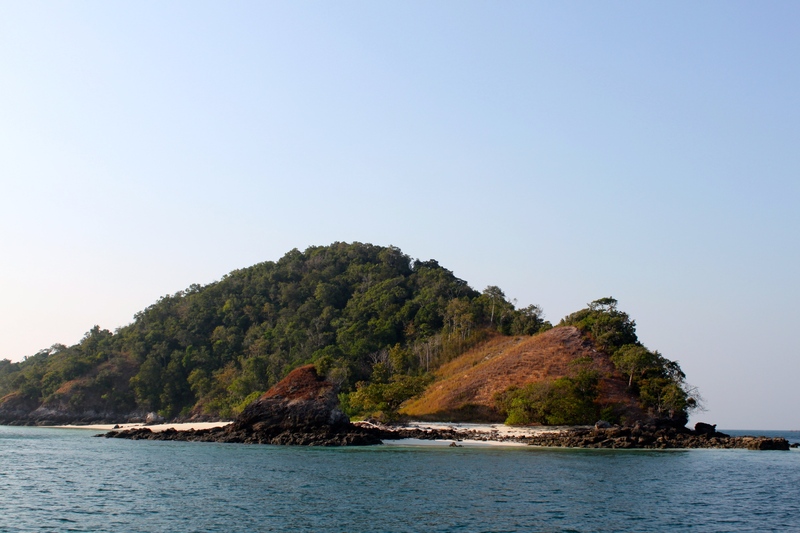 Rather than head further north, we travelled southwest towards Bo Ywe Island where we stopped for lunch. 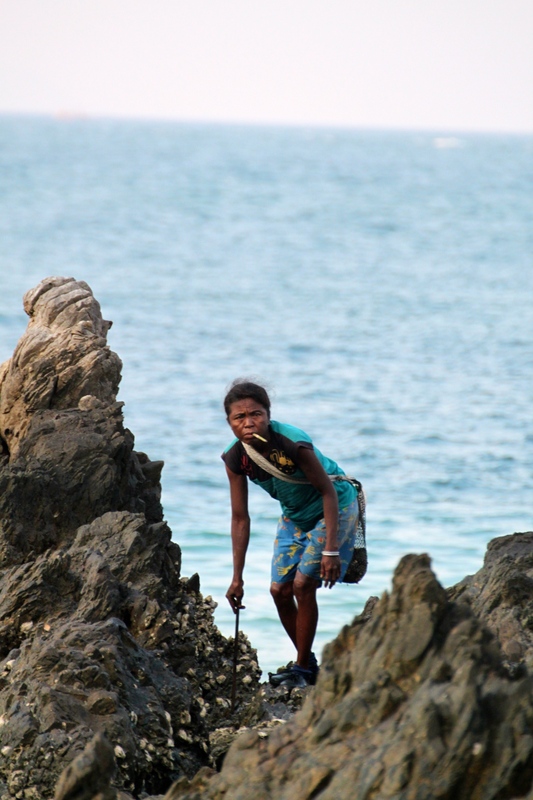 The Moken people believe the fresh water stream on the island is sacred here and where the stream emerges from the rock into a waterfall, there is a mini shrine where ribbons and offerings have been left on a nearby tree. 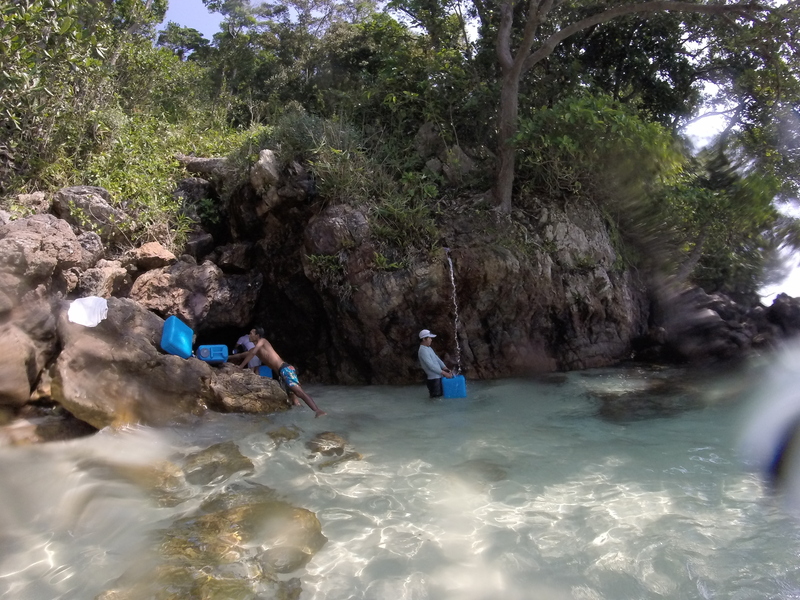 The crew took the chance to refill our water tanks and do some laundry with the fresh water and I swam to the shore with a snorkel. The tide was up so there was no beach but I sat on a rock to look at the view and showered under the fresh waterfall. We had lunch and then set sail again for about 30 minutes to the final stop for the day, Nga Mann Island. 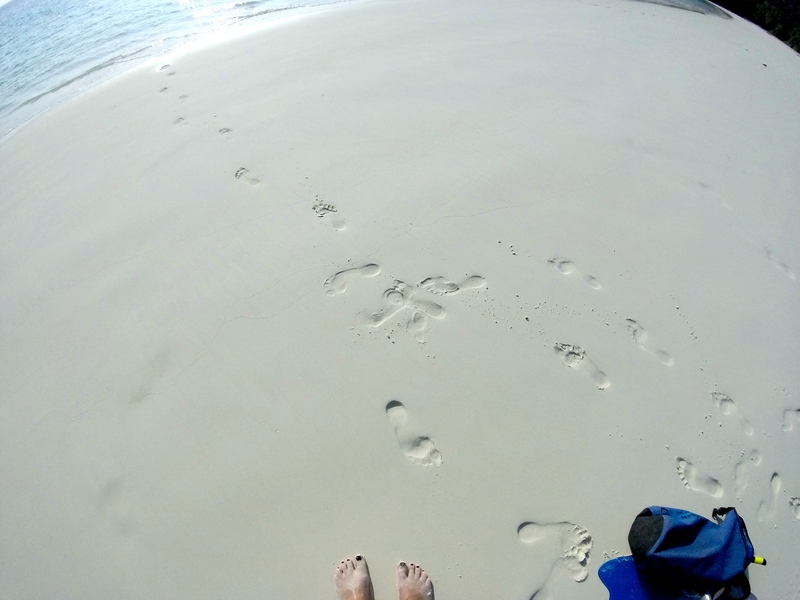 The wide beach was strikingly white and we got a lift to shore in the dinghy. 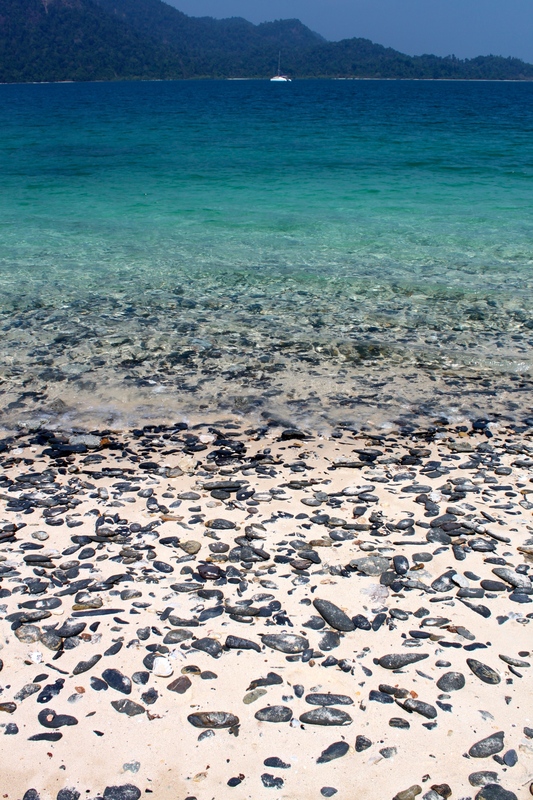 I left by bag on the sand and I snorkelled around the rocks and did a loop back to the beach. 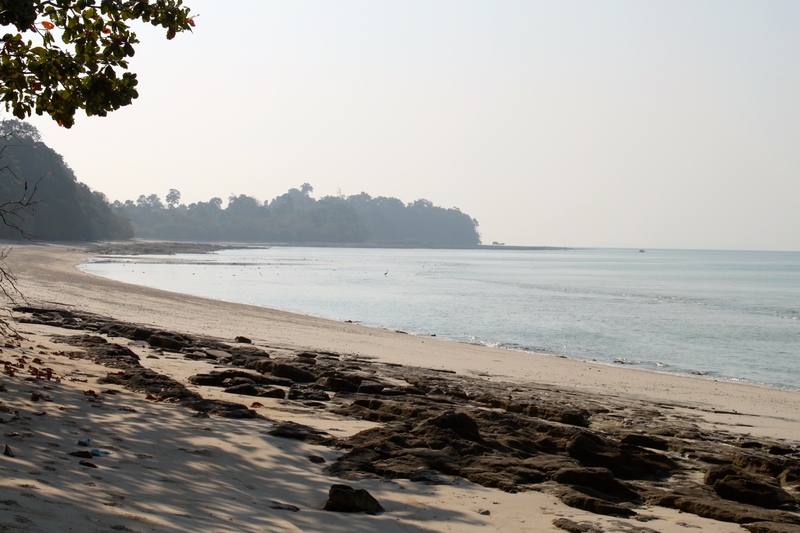 Once again it looks as though only a handful of people have sat on this beach, it was completely unspoilt by any signs of life and the dense jungle hummed with wildlife that we could only hear but not see. Unfortunately, sand flies attacked me with a vengeance again and I had to swim back to the boat for some relief from the itching. I have counted about 20 bites on each arm, a couple on my face and a few on my legs. The sand fly actually looks like a harmless little thunder fly until you spot the sack of blood (your blood) growing on its back. 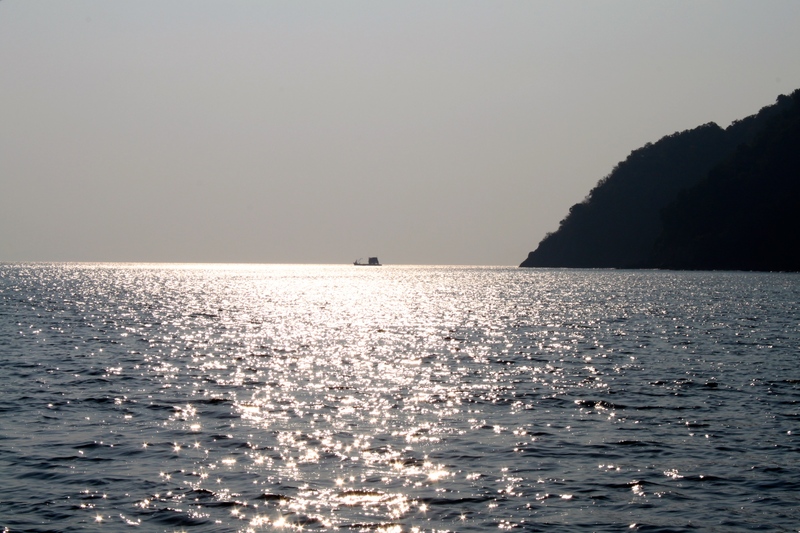 Being in the sea is a relief although swimming against the current was tiring. We watched the sun go down from the boat then the crew loaded up the dinghy and we headed back to the beach with the fish that the guys had caught earlier in the day for a barbeque. I was prepared with long sleeves, long trousers and socks on and we had a lovely evening by the fire, looking at the stars and the moon. We hadn’t sailed far this morning before reaching Poni Island, the same island as day 2 but this time on the north coast bay. Unless I was told we were on the same island it would have been impossible to guess, as the scenery was completely different. David and I got into kayaks and made our way to the beach. As I was approaching, I thought I could see tourists and I was right. A group of British tourists were making a stop there too and although normally you would think we would want to avoid other tourists, it was actually a lovely hello after seeing no one for the past week. The beach was covered with flat black pumice rocks with lovely patterns and holes on them. “A stone skimmer’s paradise” as Brian called it. We walked around a bit and had a look at the huge strangler fig trees lining the sand and then paddled back to base. 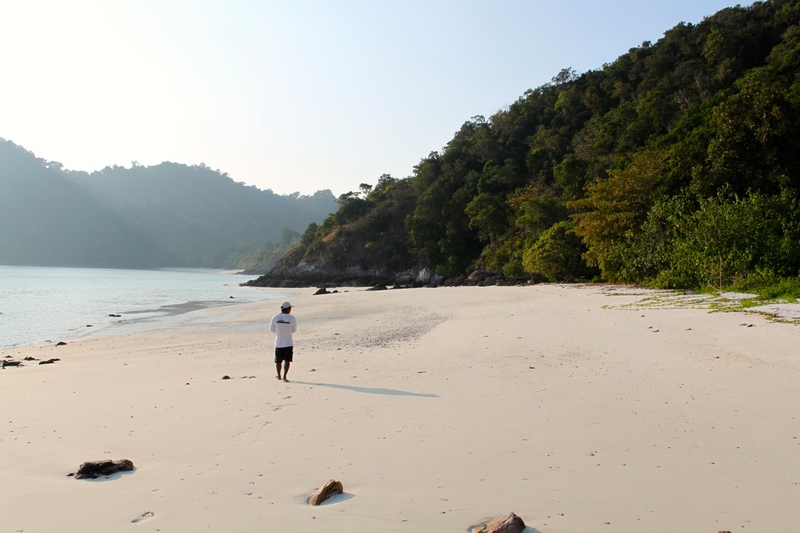 Brian made an executive decision to not bother going to the island with the half built resort on it as per the itinerary (which we all agreed to) and we made a short hop round to Bo Yar Nyant Island instead. The long beach had a little island of rock at the end of it and I swam the 1km route round the rock and back to the boat with my snorkel. You could see herons perched on the rock, looking at everything and there were huge oysters covering the rocky coral just below the water so I had to be careful I didn’t swim straight in to it. In the morning Brian suggested we go for a walk to explore the beginnings of the path he had found yesterday that seemed to lead into the jungle. We estimated that the island is only about 300m wide so should be easy enough to cross through it. We set off along what seemed to be a well-trodden path but came to quite an abrupt halt half way through where we were blocked by a huge bamboo tree. 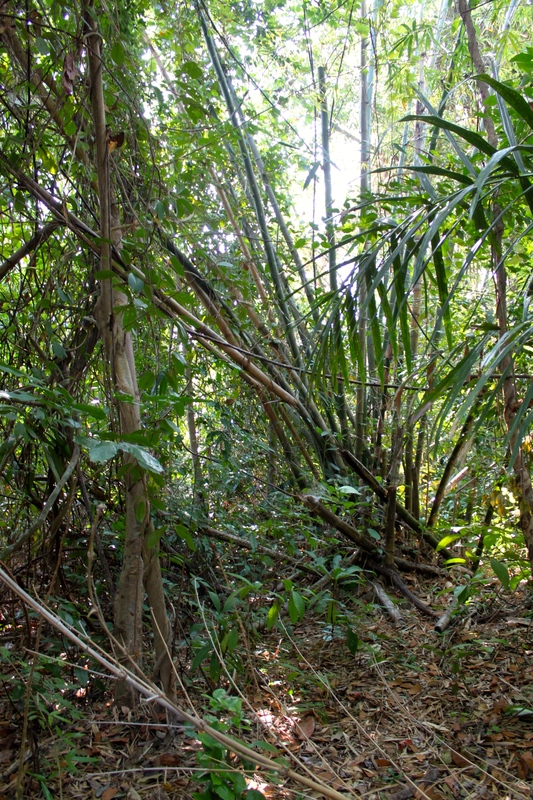 The guide explained that the Moken probably just beat a path to the bamboo and that was it, no need to carry on. We had to be careful again not to walk into a big thorny plant and there were some huge funnel shaped thick spider webs that I sprinted past without looking too closely at. 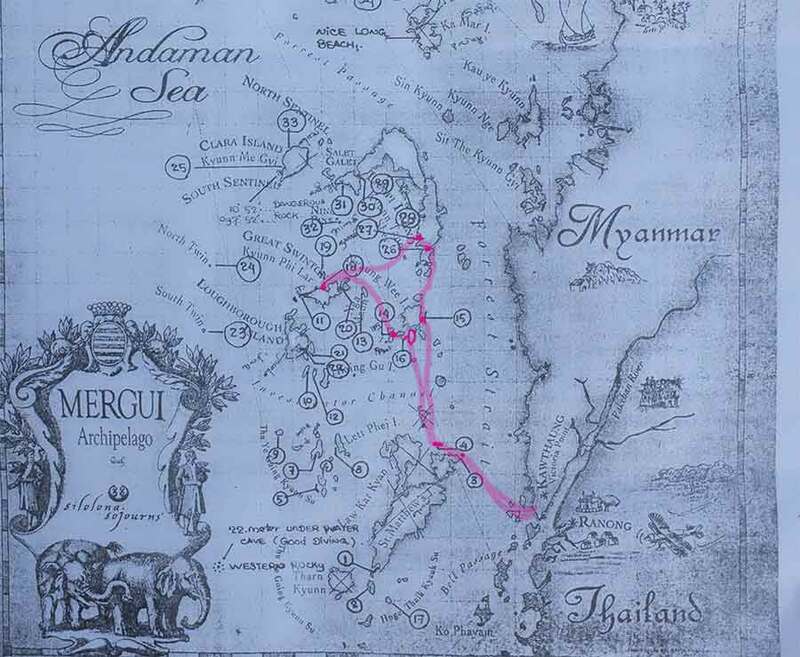 We set sail again and continued back on a similar course toward Kawthaung where I need to catch my flight back to Yangon tomorrow. 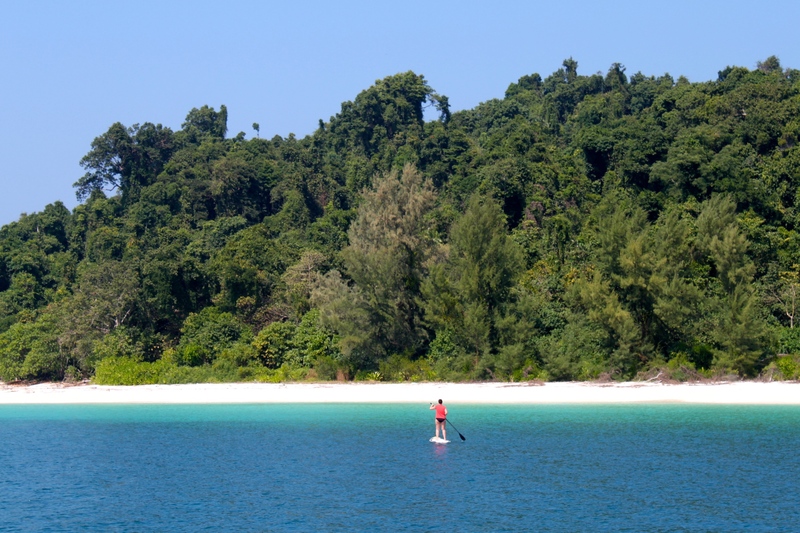 We stopped for about an hour at a quiet cove at Myauk Ni Island and I paddle boarded to the beach (quite the expert now if I do say so myself!) and had a look at some huge fruit bats hanging from a tree inland from the sand. 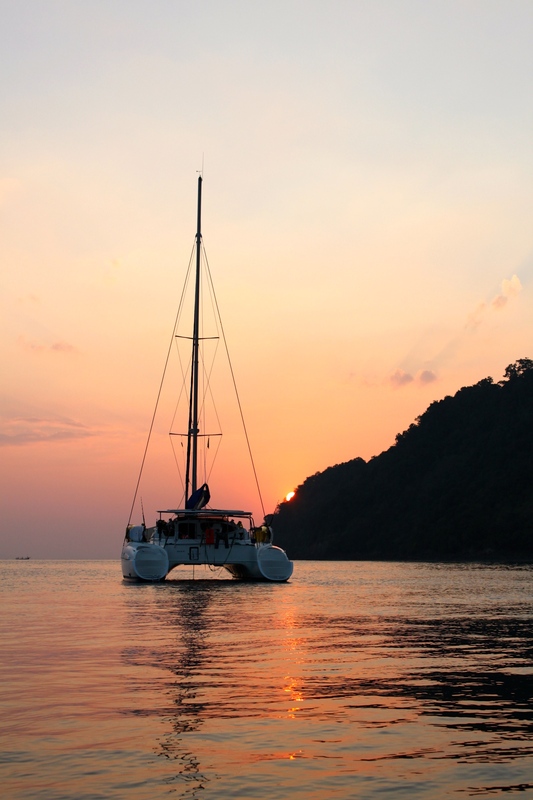 We had some more sailing to do so we set off again and arrived at our final destination, Thai Yae Island, at about 4pm – the channel where we had initially anchored on the first night. 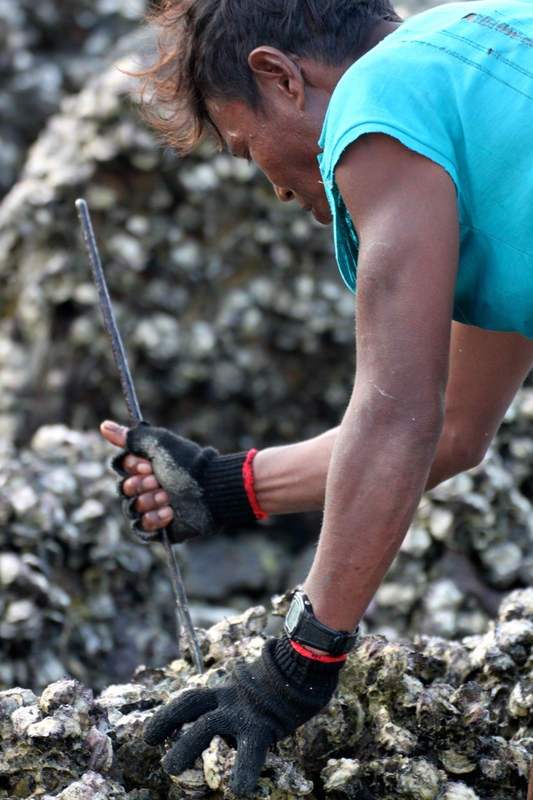 It was quite busy with fishing boats and I swam while David kayaked to the sweeping beach. 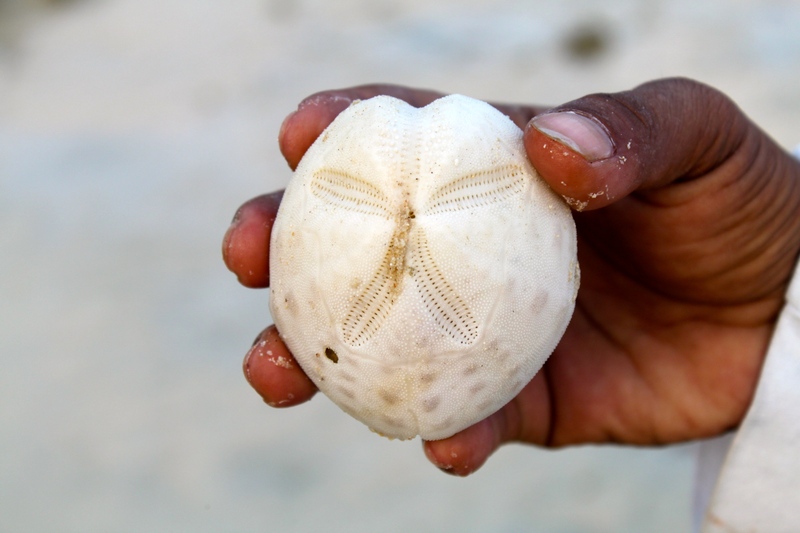 The sand here was speckled with terracotta coloured stones and as I walked along I could see huge clam style shells and big apple trees coming out of the jungle and onto the beach. As I swam back there was a very strong current and it was difficult to get back to the boat. Halfway there, as I was watching my old friends the Brahminy Kites doing some hunting, I was nearly run over by a fishing boat. 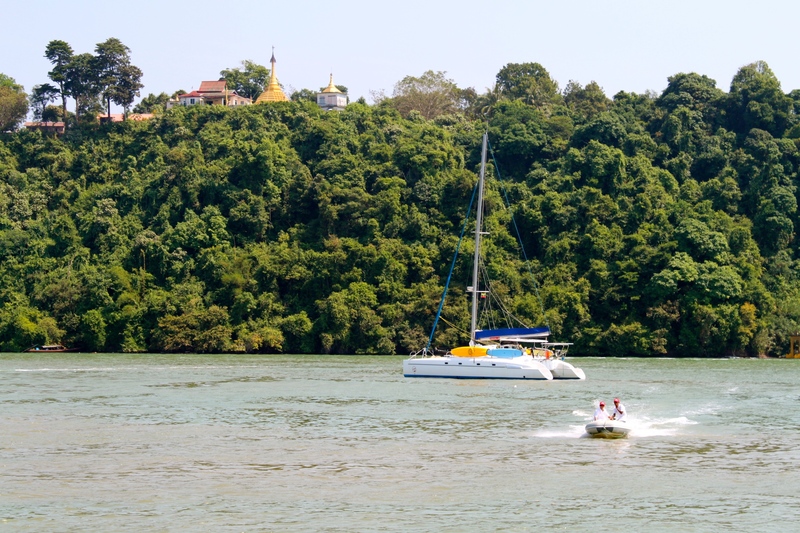 As they sailed past, they were shouting “Hey you!”, which is a play on words in Burmese. 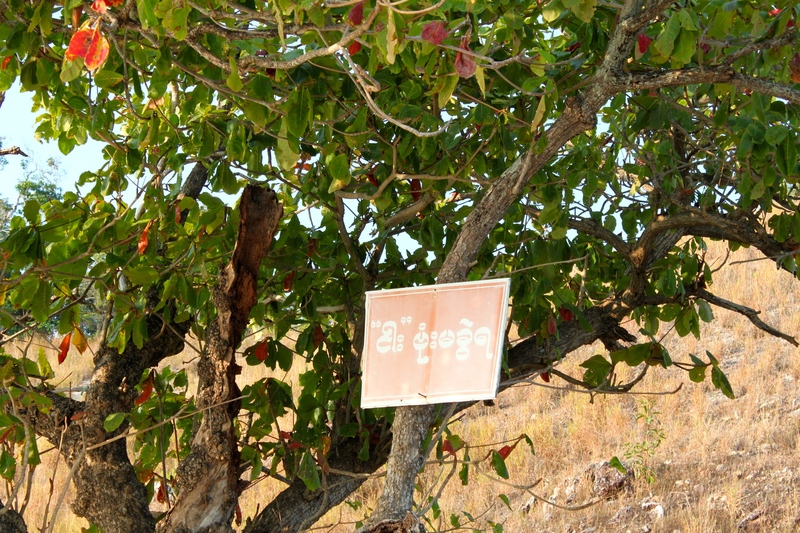 ‘Ay yu’ in Burmese means ‘mad’ or ‘insane’ so they find this particularly funny – our guide thought it was hilarious. Anyway, the main thing was they didn’t run me over, ha ha. I tried my hand at some fishing when I got back to the boat and I caught a grouper that we ate for dinner. 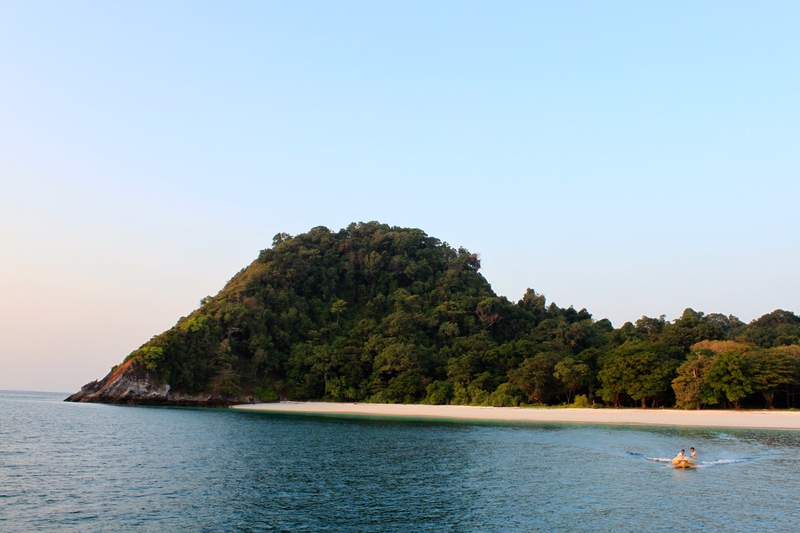 Myeik (or Mergui in English) Archipelago has been a fascinating place. Time has flown past but at the same time I feel like I’ve been here forever. It’s certainly not what I expected, though what I expected I’m not sure. The birdlife has been stunning but I fear most of the wildlife and the reefs have been damaged by dynamite fisherman or poachers. Our guide said that there was once a herd of elephants on one of the larger islands but he hasn’t seen them for two years now. Apparently there are also leopards so I hope they are still there. 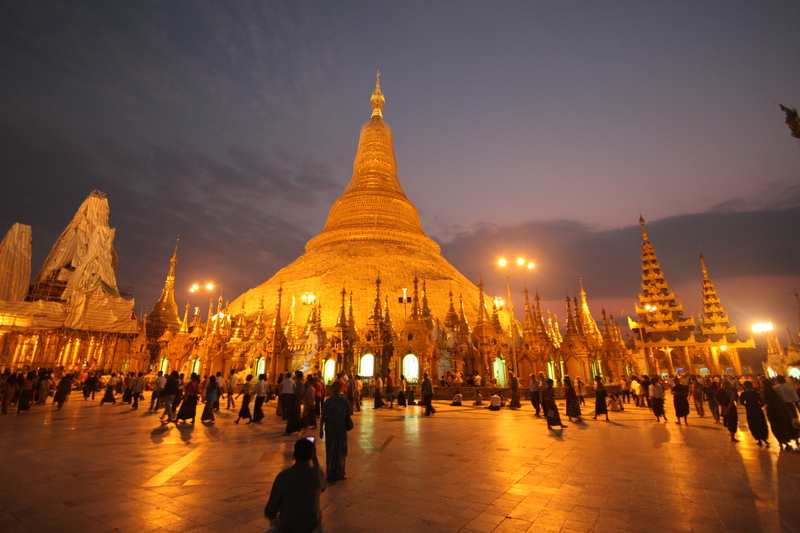 Tomorrow we will arrive in Kawthaung early and I will return to Yangon for my final night in this intriguing country. Would it be alright if I used one of your photos on my blog (http://theworldisnotthatbig.com/)? 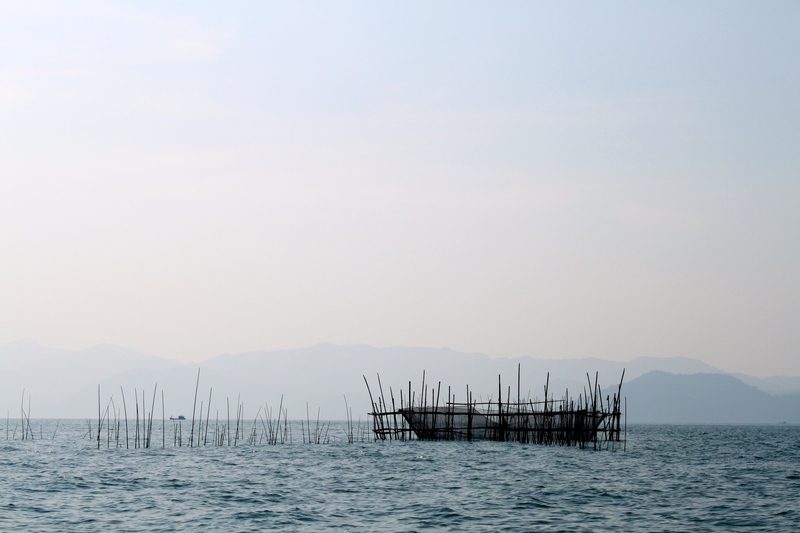 I am planning a blog post featuring 10 Asian blogs and places that I have found interesting. I would like to use a picture and then do a one paragraph writeup of your blog with links and credit to you. Thanks Kirk, it looks great – thank you for putting me on your list!